For this weeks From Page To Screen I have decided to cover Twilight: Eclipse by Stephenie Meyer. Here's a bit of back story in case some of you aren't familiar with the novel. Twilight: Eclipse is a novel written by Author Stephenie Meyer. The book was originally published August 7, 2007 by Little,Brown. 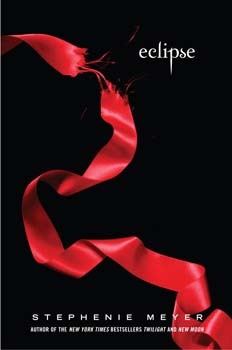 Twilight: Eclipse is the 3rd book in the Twilight Saga and follows Bella during her Senior Year. Twilight: Eclipse released to widespread critical acclaim and many critics agreed that this was due to Eclipse taking a more adult approach to the characters relationships. Twilight: Eclipse had a print run of a million copies and sold over 150,000 units on its release day. However, it did not stay at #1 long due to Harry Potter and The Deathly Hallows pushing it off the top spot. Bella Swan- A teenage girl who lives in Forks. She is deeply in love with Edward Cullen who just happens to be a vampire. Bella continues to be conflicted about her feelings for her best friend Jacob. Her decision will change her life forever. Edward Cullen- Bella's boyfriend. Edward a vampire is part of the Olympic Coven and only drinks the blood of animals though its implied he is very tempted by Bella's blood. Edward broods over Bella's relationship with Jacob. Ultimately forcing her to choose him by proposing marriage. Jacob Black- Bella's best friend and also a Quileute Native American and werewolf. Jacob has deeply fallen in love with Bella and is pained that she doesn't return his affections completely. In case some of you aren't familiar with the film, here is a bit of back story. Twilight: Eclipse was directed by David Slade and was released June 30, 2010 by Maverick Films. 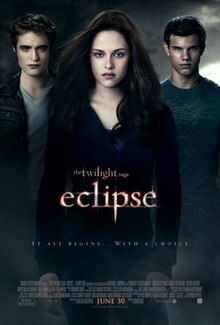 Twilight: Eclipse cost $68 million to make and went on to make over $698 million worldwide. Until 2011, Twilight: Eclipse held the record for highest grossing midnight viewing earning over $30 million. The film opened to mixed acclaim but most agreed it was much more solid than the previous film New Moon. Fun Fact: Rachelle LaFevre who played Victoria in the first two films was replaced by Bryce Dallas Howard for Twilight: Eclipse due to "scheduling conflicts". Bryce Dallas Howard had originally declined the role in the first film citing it was way too small but eagerly agreed to play her for Twilight: Eclipse. Bella calls Edward to tell him that Jacob kissed her. He arrives shortly thereafter. Edward arrives at Bella's house the same time Bella and Jacob return. He already knows he kissed her. The council meeting with Jacob's tribe happens on a moutaintop. The council meeting happens at Jacob's house. Bella expresses sorrow and guilt for having to reject Jacob. She cries in Edwards arms over this. Bella tells Jacob her choice point blank and does not cry. Jasper and Maria have no romantic relationship though Jasper does think very highly of her. Jasper and Maria had a "relationship" but he later finds out she was only using him. After punching Jacob for kissing her, Bella needs to wear a brace on her hand. She still has it on during the final battle. Bella wears a bandage on her wrist after punching Jacob but it is removed quite quickly and is not seen during the final battle. After being injured during the battle the pack has to convince Jacob to turn back into a human so Carlisle can set his bones. Jacob turns back into a Human once the pain from his injuries sets in. Carlisle ask the Denali coven to help fight the newborns. Since Irina had a relationship with Laurent and the wolves killed him they refuse. Irina's and Laurent's relationship is never mentioned and the Cullens don't ask the other coven for help. Jacob overhears Edward and Bella in the tent mention they are engaged. Jacob in wolf form runs off in despair. Edward and Bella are outside the tent talking about their engagement. Jacob in human form overhears. Bella then gets angry at Edward telling him she didn't want Jacob to know until after the battle. Jacob says Bella would be better off dead than being turned into a Vampire. Bella doesn't want to hear this and rides off on her motorcycle. Jacob tells Bella he'd rather see her dead than turned. She is visibly upset by his statement so Jacob quickly apologizes. Jacob carries a pair of shorts with him that he keeps strapped to his leg. He goes on to explain that a single pair of shorts is easier to carry than an entire outfit. Jacob does not carry clothing with him and it is never explained how he has clothing on when changing back. Edward has no trouble dismembering Victoria. Victoria nearly kills Edward by ripping off his head. He is saved by Bella who cuts herself to distract Victoria. Now I know that this book has a bunch more changes but these were the ones I remembered standing out the most. You'll have to forgive me if I forgot any as it has been a few years since last reading the book. Which however do I prefer? 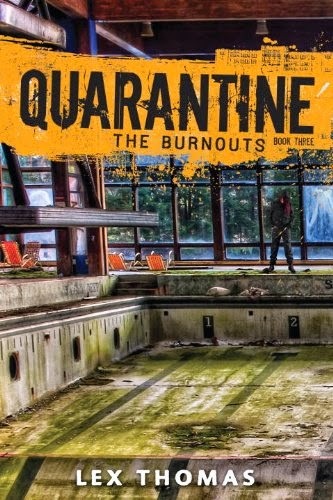 As much as I love seeing a shirtless Taylor Lautner, this week I give it to the book. I think Bella is a little more likable on the page than on screen and you can really tell how deeply she loves Jacob and how Edward whether consciously or not keeps sucking her back to him. Definitely read the book if you haven't already and if you haven't watched the film yet you should do so at least once. What is your favorite quote or scene from Twilight: Eclipse? Just for fun: Do you believe Bella should have chosen Jacob?